A late harvest Riesling with fruity sweetness and great aging potential, aromatic bouquet of honey, melon, ripe fruits. Grapes come from Brauneberger Juffer and Juffer-Sonnenuhr - one of the most prestigious vineyards in the Mosel winegrowing region. The vineyard faces south and provides the best conditions for growing Riesling. Pairs well with pâté, Asian cuisine. "Possessing a richer, off-dry style, yet still clean and balanced, the 2015 Brauneberger Juffer Riesling Spätlese offers terrific notes of crushed rocks, dried herbs, and sugared citrus to go with a medium to full-bodied, textured, layered style on the palate that makes it incredibly drinkable. As with the other Riesling from this estate, it’s impeccably made and is going to shine on the dinner table." Owner: Ulrike Oeffling (Leimbrock) Winery Philosophy: Tradition meets Care The Dr. Leimbrock – C. Schmidt winery has been family-owned for more than 250 years and looks back on a long tradition of producing fine wines. 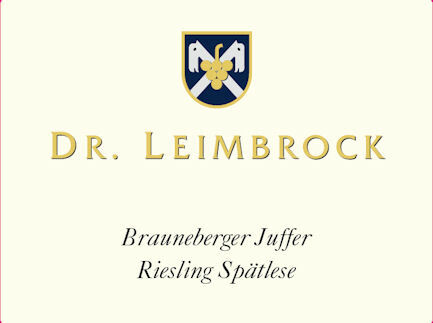 The current vineyard of Dr. Leimbrock – C. Schmidt was founded in 1967 by Friedhelm Leimbrock and Lore Leimbrock nee Schmidt from the companies of their forefathers Friedrich Herrmann, Dr. Wilhelm Leimbrock and Conrad Schmidt. Winery/Vineyards Winery Acreage: 22 acres Winery Production: 7,500 cases / 9L cases Varietals Produced: Riesling, Weißer Burgunder, Kerner Winemaker: Dr. Friedhelm Leimbrock We cultivate our Riesling on 8.5 hectares in the best locations in Veldenz, Mülheim, Brauneberg, Bernkastel and Graach. The soils of our vineyards originate from the ‘Devon’ soil and are composed of weathered slate. 60% of the hills of our vineyard are aptly named – their slopes are 30-80% steep! Ideal locations for Riesling where each area possesses an unmistakable character. Whether Mülheimer Sonnenlay, Veldenzer Bitsch, Brauneberger Juffer, Brauneberger Juffer-Sonnenuhr, Graacher Himmelreich, or the Bernkasteler Badstube, we have some of the best locations on the Mosel. The vineyard is led by Mrs. Ulrike Oeffling. The vines are cultivated in a natural way. We follow guidelines for fertilization, planting and soil protection that are the best for the environment.